This book offers key tools and tactics that help school leaders navigate the complex and busy work of improving a school, allowing them to maintain success during the full calendar year. 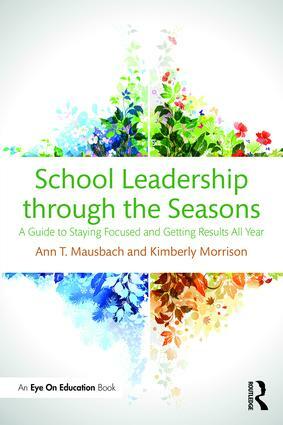 Through practical guidance and "Have to Do" strategies, School Leadership through the Seasons breaks down the challenges of leading a school into manageable steps that align with the seasons of the year. After reading this book, you’ll be able to: implement school improvement processes at high levels, build a culture and climate that promotes safety and learning, and respond to student and staff needs. "This text is a superior primer for the aspiring school leader as well as a ‘how-to’ manual for current school principals. Using easy to understand analogies and examples of administrative practice, the authors offer a progressive systemic approach to leading schools." "In this research-based, tried and true, step-by-step guide, the authors break down the complex task of school improvement in a way that helps administrators and schools achieve positive results. Using theories backed up by real-life examples, the authors simplify the complexities of school improvement to a degree that any educational leader can benefit and increase positive results in their team, school, or district." "Mausbach and Morrison provide timely and precise tools, processes, strategies, and examples that every principal can utilize to improve professional capital within their school, and create a growth-minded system and a culture targeting student learning." "With a balance of theory and practical application, this book will assist any educator in improving student performance." Ann T. Mausbach is Assistant Professor for Educational Leadership at Creighton University and formerly held positions as an assistant superintendent for curriculum and instruction, coordinator of staff development, director of curriculum, and director of elementary education. Kim Morrison is the principal of an urban middle school located in the Midwest and has been in elementary and district administration for over fifteen years.